In the past few months, 18 Terran ships had vanished from the galaxy. Terra had to find out what—or who—was behind it. Lieutenant Ted Narly of the Terran Defense Corps discovered the cause: a new totalitarian regime of Deotians, determined to take revenge for their defeat in the Great Wars thirty years before. Taken captive, Narly was escorted to the secret Deotian empire, Planet Big Zero, a huge black nebula with only one entrance—a cone shaped funnel with a curtain of fire at the end. Narly knew if the Terran fleet attempted to attack through the funnel, every ship would be destroyed. It was up to him to save mankind from destruction…but what could one man do against a hate-filled enemy bent on mastery of the universe? Holy cow, the back of this book has so many lies on it that I’m not sure where to start. The first two paragraphs are roughly correct. I’m not sure that the totalitarian regime was actually new, but a new ruler cropped up about halfway through the book, so maybe it counts. 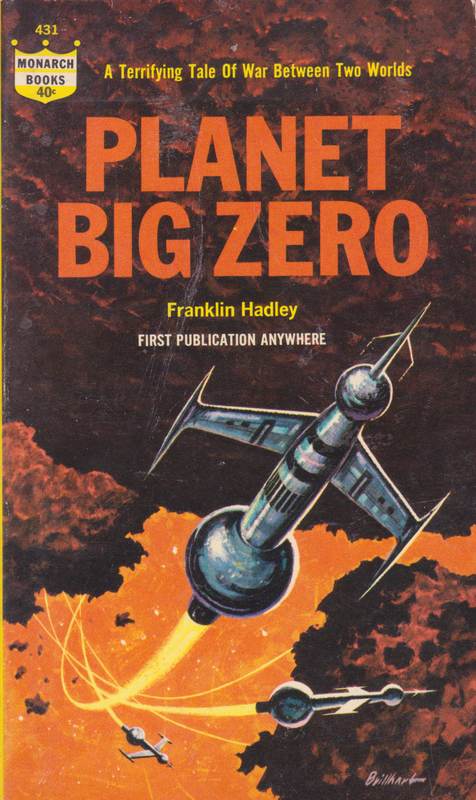 The titular Planet Big Zero, however, was not a nebula. It may come as a surprise to you that a thing named a planet was not a thing that was not a planet. The nebula itself was just named “Big Zero.” The planets (plural!) inside were named Deotia and Avenger. We never saw much of Avenger. Also, the nebula didn’t have one entrance. It had two. Much was made of this fact in the book. It was important. Also the “curtain of fire” didn’t happen until about three quarters of the way through the novel. The last paragraph is roughly accurate again, but we come down to that interesting element of book covers that ramps all matters of scale up a level. The Deotians (actually not altogether accurate, but I’ll get to that) didn’t want to conquer the universe. One of them (again not entirely accurate, sorry) wanted to conquer the galaxy. Okay, so now that all that’s out of the way, what about the text inside the covers? Well, it wasn’t bad. It wasn’t great, but it was competent. The story didn’t rock my world, but it didn’t leave me disappointed. I’d categorize this book as maybe a tick or two above complete meh. Our hero, and he actually deserves the title because he does do some pretty heroic things, is named Ted Narly. I hate his name. He was all right as a character, but he was always referred to as “Narly,” which looks a lot like “Nearly.” Sentences like “Narly crept through the corridor” looked like “Nearly crept through the corridor” which would make me look twice because it seemed like the subject of the sentence had been left out. And the thing is, this book was so riddled with typos that it would have made a lot of sense for that to happen. It was confusing twice. The deal with this book is that about thirty years prior to its events, there was a great big war between the Terrans (take a shot) and the Deotians. The Deotians are some kind of dog or wolf people. They’re never described in all that much detail. They’re a militaristic race, though. Everything they do is done to wage war. There’s also a lot of internal strife because of the way their system is set up. There are five hundred “princes” who owe fealty to a guy called the Dariune. To become Dariune you have to first be a prince and then challenge the Dariune in single combat and win. Becoming a prince is basically the same deal except you start from the bottom. The end of the previous war was supposed to be the end of the Deotians, but the Terran commander of that war decided to let the Deotians escape. It turned out to be a big mistake. Thing is, we eventually learn about the start of that war. It turns out that humankind was setting out among the stars when they hit upon a planet around Vega. There was a small Deotian outpost and the Terrans were all “Hey, you’re only using like one percent of this planet, can we set up here too?” and the Deotians were all “No” and the Terrans were all “Well nuts to you we’ll set up anyway” and the Deotians were all “pew pew pew” and the Terrans were all “pew pew pew” back and then it turned into a war. Thing is, doesn’t this make the Terrans the aggressors in this war? Sure, the Deotians didn’t have to respond with deadly force, but we totally started it. We invaded their planet. We were like a bully going “Come on, man, you don’t need all of your milk money” and then got mad when the other kid said “Shove it” and then hit back. Anyway, that’s all in the past. The story starts with Narly and his crewmate, Captain Oliver, heading off to a planet called Paradise to investigate some missing ships. Paradise is, as you’d probably expect, a hellhole. Using the ship’s “aromar,” which is probably the best concept this book gave us all, they manage to detect that yes, there were some ships here once but no, they are not currently here. Big help. Aromar is a method by which particles are scanned to detect things like ship exhaust. See, it’s like radar, but with smell. Awesome. The two men land and then get into an argument over who will stay and guard the ship and who will head out toward town to see if they can get any information. Eventually the captain agrees to stay, although at one point he explains that he’s the more expendable one so he should go. I bring this up because one of his arguments is that he’s set to retire after this mission ends. He dies on page 16. What is later revealed to be a Deotian ship lands and kills the captain (the Deotian laser beam “pops him like a balloon”) and captures Narly, along with a bunch of people from the colony. One of those people from the colony is a young lady macguffin named Linna. Narly falls in love with her from the moment they meet, of course, and she becomes his motivation for the rest of the book. To their credit, the bad guys figure this out quickly and use her as a hostage to get Narly to do everything they want him to. The guy leading the attack turns out not to be a Deotian at all. He’s named Huuji and he’s a human. His family was captured in the last war and he was brought up as a slave, but got his freedom somehow and rose to be one of the 500 princes of Deotia. He’s got ambition and he hates humanity for letting him get captured in the first place. He also hates the Deotians, but he’s got enough sense to hide that. He’s not a bad villain, really. All he wants to do is take over the Deotian empire and then use that to take over the rest of the galaxy. As far as this book is concerned, there are only two sapient species in the galaxy, so it’s not like it would be a difficult job. Huuji forces Narly to fly his ship to Big Zero, where he reveals that there are only two ways in and that Narly will become his slave and all kinds of things like that. Narly thinks he’s being clever when he sends out a coded message to alert Space Command (or whatever it was called) as to where he’s going. Huuji was one step ahead of him, though, and intended for that to happen. His plan is to use the attack on Paradise and Narly’s message to lure the Terran fleet into a trap and wipe them out in a decisive maneuver. It’s not a bad one. Things go poorly for Narly on Deotia. He’s kept prisoner until Huuji makes him his personal bodyguard. Narly’s sense of honor causes him to follow his orders to the letter. Well, that and the fact that Huuji will kill Linna if Narly doesn’t do what he says. She doesn’t do much for herself in this book, to say the least. She’s more or less just bait. Huuji takes his oncoming victory as an excuse to challenge the current Dariune to a duel. Huuji wins handily even though by tradition the challenger is at a disadvantage. See, the Dariune has a slightly longer sword than the challenger, and also wears a breastplate. Deotian males all go with their upper bodies uncovered except for the Dariune. The text also tells us that Deotian females (whom we never actually see) wear sweaters. After Huuji takes over he starts making some changes around this place. He defies tradition and starts wearing a gun. The Palace Guard, whom we learn are the folks running the whole show, are getting a bit annoyed at this pompous human’s defiance of their sacred traditions, not to mention telling them where they can stick their “advice.” The head of the Palace Guard recruits Narly to assassinate Huuji at the next opportunity. The plan is that Narly will be flying a ship during the oncoming slaughter of the humans and will shoot Huuji in the back while the battle is going on. Narly figures he doesn’t have much to lose, although then it’s revealed that Linna will be on the ship with Huuji (Huuji figures on marrying her, mostly just to annoy Narly) and Narly gets all Hamlet. He notes that the two entrances to Big Zero are being covered by the Deotian fleet. They’re able to fire their lasers continuously because they’re solar powered, so they set up big nets around the entrances of laser beams so that anything that tries to get through will be fried. They’re counting on the human fleet just rushing in there and getting blown up. I guess I should mention just what Big Zero is. It’s a nebula, like I’ve mentioned, but it’s a dark nebula several billion miles thick, so no light gets in or out. It’s also hollow, though. It’s about a light year across on the inside. There are funnel-shaped entrances at the north and south poles. It’s a perfect place to stage an ambush. Narly realizes that he’ll never be able to escape through one of the entrances, so he tries something ridiculous. No ship can fly through the nebula because it’s got rocks and stuff in it, densely packed, that will destroy anything that tries to do so. His figuring, though, is that he’ll just turn the lasers on and let them drill a hole for him. Why didn’t anybody try that before? It works, and then it works again when he tells the amassed Terran fleet about what’s going on. A hundred ships drill back through the nebula, far away from the concentrated Deotian fleets, and strike out for the unprotected Deotian homeworld. I’ve typed “Deotian” so many times that it’s almost lost all meaning. I’m still not sure how to pronounce it. I’ve been going with “Day Ocean,” the name of my next prog band. The scheme works and the day is saved. The fleet guarding the entrances is withdrawn back to the homeworld, allowing the rest of the Terran fleet to funnel on through to victory. Narly uses a jetpack to get to the remains of Huuji’s ship and see if maybe Linna is still alive. Turns out she is, but so is Huuji, who holds her hostage. At just the right time, the ship passes into the shadow of the planet and everything gets dark. Narly has just enough smarts or gumption or luck or whatever to take advantage of this situation, reach behind Huuji, and remove his air supply. Huuji suffocates and dies, Narly and Linna are rescued, and the book ends with epic smooches. There’s just not a lot to complain about in this book. There’s also not a lot to praise. It had a few original elements that I could get behind, and they were handled pretty well, but there was little to no excitement or danger. Whenever a problem came up, I knew almost immediately how it was going to be avoided or countered. That’s not self-aggrandizement. I think just about anybody reading this one would react the same way. “Oh, you can’t go through the entrances to the nebula, so I guess they’ll have to make their own.” Stuff like that. This one’s a hard one to rate. It hovers just above perfectly neutral, but then at the same time I don’t want to give anybody the impression that I actually liked it. I also didn’t dislike it. It’s just sort of there. It was enjoyable at times, but it was also boring at others. The thing that confuses me is that a lot of books that fall so far into the middle are hard for me to read. If there’s nothing to grab me, either good or bad, I just dismiss the book altogether and have to struggle through it. But this one kept me going. I fell asleep a few times yesterday while reading it, but I think I was just tired. Today I read the second half in one go. It was a fast read. It was also a short book, clocking in at around 120 pages. Any longer and I think it would have been a chore, but it was at least streamlined. The science was even pretty good. Sure, ships could go past light speed and no reason was given (they just go fast), but radio is still limited to the speed of light and so the most efficient means of communication is to send actual people. It’s a plot hook we’ve seen a number of times, but I still like it. Other things, like how the nebula worked and people’s reactions under pressure, were at least believable. They might not be entirely accurate (at least in terms of the nebula thing. The psychological elements were pretty spot on but basic stuff), but at least it wasn’t absurd. I’m not going to recommend you read this one unless you have a good reason to, but I’m also not going to suggest that if you have enjoyed it you should feel bad about yourself. Just wanted to let u know that I nominated u for th Liebster Award! Enjoy th questions I set u! Thanks for some amazing Posts!